We just came across a gem from the blog Conflicts and Resolutions highlighting an exchange between State Department Spokesperson John Kirby and Said Arikat, a reporter for the Palestinian Al Quds news network, during a press briefing on June 16th. QUESTION: — of the West Bank. Now, the Israelis, including settlers, they get about 300 liters per day, Palestinians get 70 liters per day, and this is basically Palestinian water. They siphon it from Palestinian areas. I wonder if you have any comment on that. First, as we clearly demonstrated when this libel appeared in the British media, the claim (citing Palestinian government officials) that “Israelis cut off water supplies” to West Bank Palestinians is completely untrue. Our communication with COGAT (the Israeli authority in the territories) and Merokot (Israel’s water carrier) revealed the following. There have been water shortages since the start of Ramadan, but these were caused naturally by an increase in demand during the hot weather months and a shortage of supply from the mountain aquifer. This water shortage has affected both Jewish and Palestinian communities in the West Bank. Israel actually increased the water supply to Palestinians in Hebron and Bethlehem, and to all Palestinian communities at night, to accommodate Muslims observing Ramadan. Additionally, the Palestinian journalist’s claim that Israeli settlers get over four times more water than Palestinians represents a version of a smear about ‘unequal water distribution’ that has been thoroughly debunked by UK Media Watch and CAMERA. 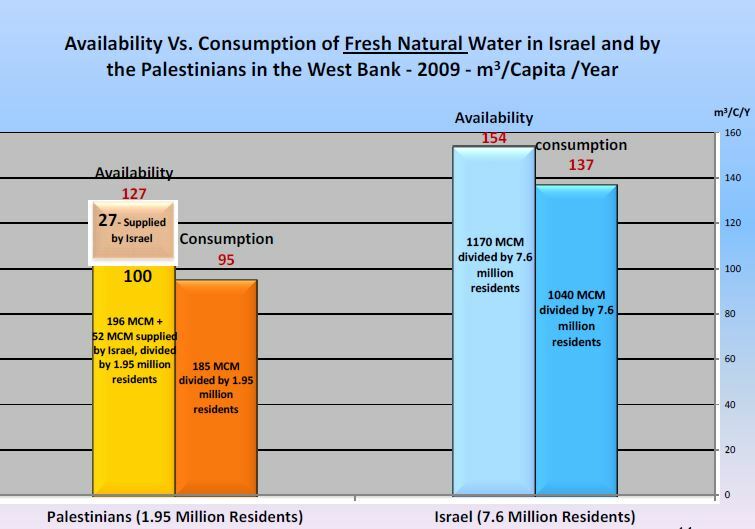 A 2012 report from the Begin-Sadat Center showed Israelis now use only marginally more water than Palestinians, and that Israel provides more water to Palestinians than it’s obligated to under Oslo. Finally, the charge that Israelis “syphon” water from the Palestinians is an inversion reality, as multiple reports have documented the problem of illegal Palestinian drilling into Israeli water sources. Though Kirby admirably dismisses the allegations by Arikat, he also unfortunately cites, in Israel defense, a relatively insignificant fact – emphasized by some groups attempting the refute the charges – concerning a temporary cut water line that only affected water availability in the West Bank for a few hours. As we’ve demonstrated in previous posts, Arikat’s charge that Israel steals Palestinian water, and cut off water to thirsty Palestinians (during Ramadan! ), is the opposite of the truth. A lie is half way round the world before the truth gets his pants on. Especially if it’s an Israeli-hating lie. What about Pal-e-SWINIAN Air? EVERYTHING that Jews have or use, Pal-e-SWINIANS claim is theirs. No! The State Department is an antisemitic cesspit and it lies about Israel??? And with Dumbo at the top, too???? I do not believe it!!!! !